The best dumbbell exercises for upper body. Hello everyone? How’s everything? Today we know that about dumbbell exercises for upper body. The upper body area is one of the areas that are most trained. Normally a high-performance athlete focuses his exercise routine on working this part of the body at least 3 or 4 times a week. When we refer to the upper body we talk about the arms, shoulders, back and abdomen. Like all training, it takes a lot of patience to see physical changes. if you properly workout this dumbbell exercises for upper body you can achieve good physics. However, with a routine of appropriate exercises you will notice in a short time remarkable changes in your physique. Once you have known what is the secret to gain muscle without pain, you must know what exercises your upper body can benefit from. The bench press is surely the most popular exercise in the world of fitness. 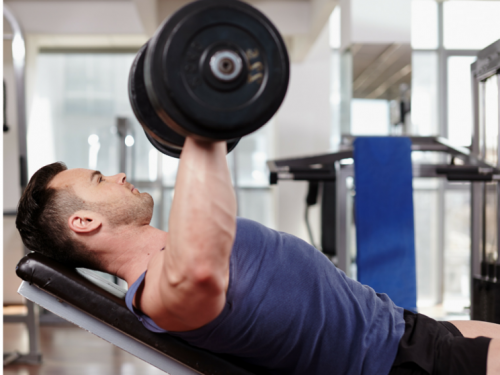 It is not surprising since there is nothing more aesthetic than large and well-developed pectorals and the bench press is the exercise that comes to mind when we think of pectoral training. Doing this exercise with a bar is the most usual, but today I suggest you incorporate the dumbbell bench press into your routine. Keep a slight arch in the lower back, always tightening the “core” of the body. With the elbows at 45 degrees from your body, slowly lower the weight to about 2 cm above your pectorals. Then, push the weight up but do not block your elbows or pause when you have the weight on you. Lie on a bench leaning with your shoulders back and down. Again, pretend that you are trying to put the shoulder blades in your back pockets and slightly arch your lower back, always keeping the core tight. With the elbows at 45 degrees from the body, lower the weight until the bar of the weight is 2 cm above your chest. Once there, push the weight up and do not block the elbows or pause while you have the weight above you. In the gym, it is common to see a certain amount of people without too much experience focusing their chest work exclusively on the bench press. However, although it is a great option, it is ideal to complement it with other types of exercises. 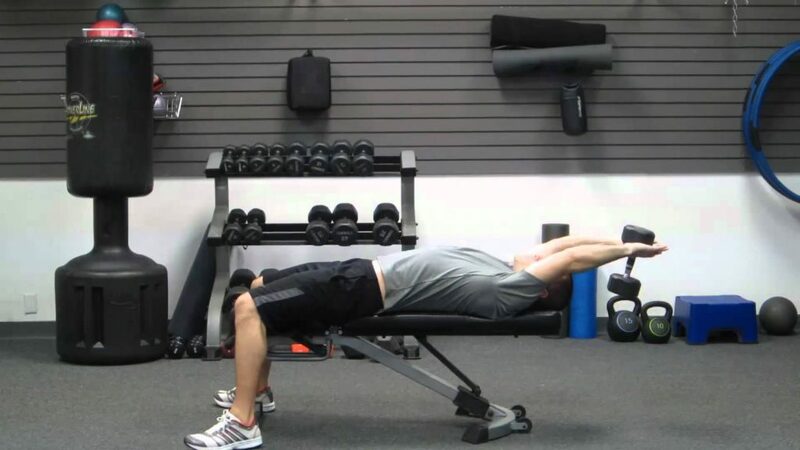 Although the ideal depends on the type of routine we follow, including the pullover is usually a very good way to stimulate the proper development of our rib cage. 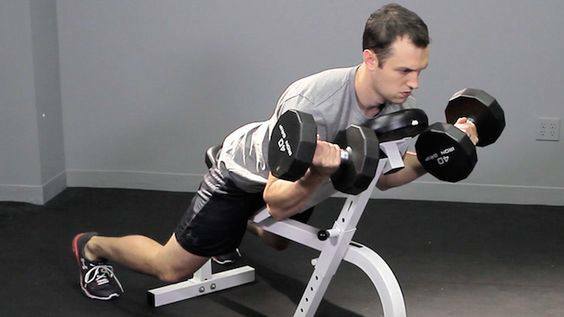 The dumbbell pullover can be executed in various ways depending on the muscle in which we want to emphasize the work. we hold a dumbbell with both hands and arms extended above our head, and we go down slowly by describing a bow back, stretching the chest at the end of the movement. At the time of placing the dumbbell behind our head, we return it to the initial position. An exercise that is great for toning your back and arms is rowing with weight. It is an exercise that can be very basic and, at the same time, can be complicated a lot, to perform complete and effective exercises. Place one hand on a bench so that it is at your knee. The back always well straight and parallel to the ground, looking slightly forward. The initial position is the arm stretched to the ground taking the weight. The arm that holds the weight will flex with the elbow up and bringing the weight closer to the hip, not toward the shoulder. You must keep the abdominal muscles in tension. That is, squeeze the belly as they were to hit you a punch and you squeeze the muscles. Hold the weight as close as possible to the hip for a second. Slowly lower the weight until the arm is stretched. The shoulders are a part of the body quite important at the time of training. On the one hand, they are one of the muscles of the upper train that most influence creating a sense of size. On the other hand, from the point of view of functionality, the shoulders are possibly the most important muscle since weight lifting above the head is the clearest manifestation of physical power in terms of upper body muscles. this dumbbell exercises for upper body shoulder is the best workout which is easily can do the dumbbells. That is why, today, I will try to bring you a full dumbbell shoulder training, which focuses only on strengthening them with a series of exercises that have proven to be effective in different subjects. Although this training for dumbbell shoulders is focused on gaining muscle mass, do not doubt that it will also contribute to increasing your strength. Another workout for shoulder is press Arnold. One of the main benefits of the Arnold press is that it provides a wide range of motion. This is obtained when we lower the weights doing the movement correctly and makes at the same time some parts of the shoulder that in other exercises do not reach or shake. This type of movement allows a greater recruitment of muscle fibers and a stronger contraction. it is the most effective and at the same time most difficult to perform shoulder training . Sit on the edge of a flat bench or on a seat with a padded backrest for support. Grab a dumbbell in each hand and hold it with your palms facing you just below the level of your eyes. The elbows must be flexed forming 90º. Lift the weights with both hands and push up, while slowly turning your hands forward to finish facing forward when we have the arm fully stretched. There is no need to block, but we must try to force the deltoid to try as hard as possible. Now slowly we lower the weights while we return them to their initial position. Complete 3 to 5 sets of 8 to 12 repetitions each. We rest 1 minute between series and series. 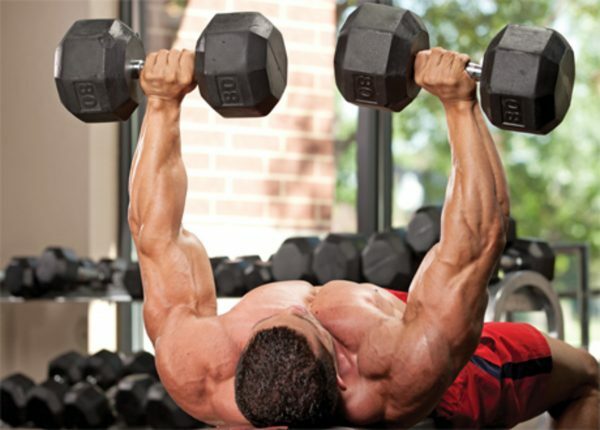 The dumbbell shoulder press is a fundamental exercise to work the muscles of the shoulders. The shoulder press works the anterior and middle fibers of the deltoid and the triceps. It can be done standing or sitting on a bench. This exercise is also known as Military Press. If you perform the standing exercise, stand up by holding two dumbbells just above the shoulders, with your arms flexed and your palms facing each other. If you do it sitting, sit at the end of a bench with your torso erect. Separate the feet the width of the shoulders and slightly bend the knees. Then raise the dumbbells until they are fully extended, blocking the elbows and maintaining tension in the body core. Finally slowly lower the dumbbells to the starting position. To perform this exercise you have to stand with an initial standing position and hold a dumbbell with one hand, behind the head, the key is to achieve a ninety-degree angle, and the upper arm must be directed straight up. 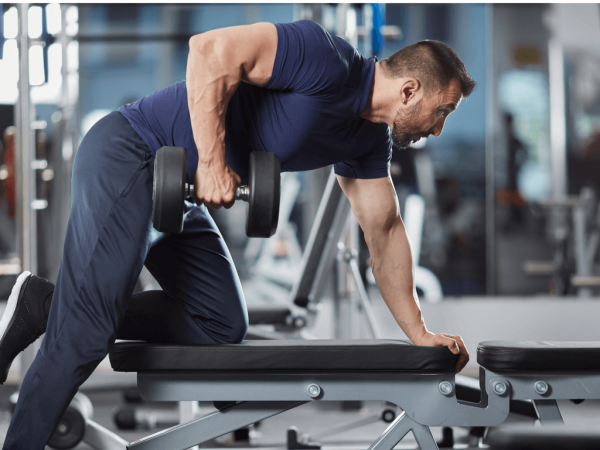 You have to start lifting the dumbbell with one hand until you get the arm fully extended and then make a slight pause and start to lower gently until you return to the starting position. After each series you have to change your arm, the idea is to alternate. This famous exercise can be performed standing or also supported on a bench, then you can see the step by step of the foot variant. So pay close attention to what comes next. First, you must stand with your feet about the width of your shoulders and then you will take a dumbbell in each hand. In this position tilts the torso to the front until you get almost a right angle with your body. Forms right angles with the arms with the elbows more or less glued to the sides and stretch the arms at the same time to stretch them completely. Hold in that position indicated a second and return to the position of right angle with the arms. Repeat the same procedure several times. The elbows should be close to the body, and lift the weights as close as possible to the shoulders (do not force if you can not reach the top). After a short pause, drop the weights again. 20 repetitions, in 4 series to start. Stand up with your chest slightly outward while holding a dumbbell in each hand. Lift the weight up and keep your wrist extended. When you carry the weight up, rotate your forearms outward until you get a deep contraction of your biceps. Do 3 sets of 10 repetitions per side. It is one of the best exercises for bigger and stronger biceps. By using a support the impulse or balance of the body is avoided, which helps a greater effect of the exercise. Remember to keep your elbows a little ahead of your shoulders, then do the bending (curl). Do the movement in a slow and controlled way, to avoid injuries. No more today. if you do this workout properly you can achieve the best shape for upper body. 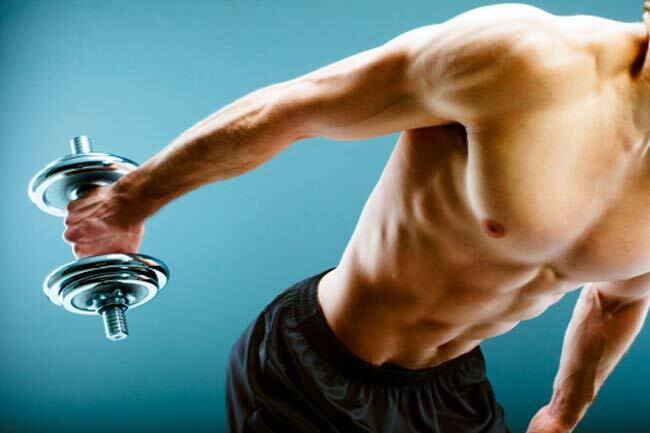 because dumbbell exercises for upper body a complete guide for workout. if you love this article don’t forget to the comment.